Oh, sometimes I still do. Was this inspired by mine? Mine dances every single time. 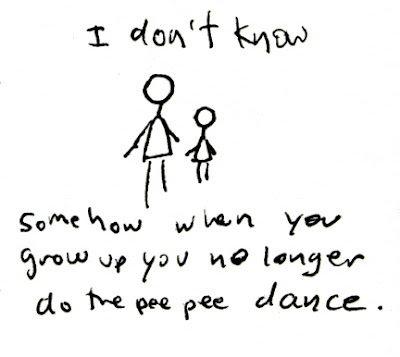 ha ha, yeah when I drew this I remembered that you still do the pee pee dance. I haven't done it in a long time. :) Maybe it is a child-like quality I should re-embrace. Sometimes I really like the Pee Pee dance. It is funny and makes me have to go more. Sort of a funny yet torturous idea. I still act like a kid. It is good. I know I want to kiss you! Let the Babies Entertain You! Let me in or Let me GO!